Well, I may not be the earliest bird, certainly not early enough to grab the worm, but I am early enough in the game to be able to get some seed, or more precisely SEED. Yup, starting this Friday, this blog will fuse with my other two blogs (Science And Politics and The Magic School Bus) and move to the ever-growing Scienceblogs.com. It does not work right now, but on Friday you will be able to access the new blog at this URL. I'll give you the Feed once I get it, so you can all change your bookmarks, blogrolls and newsfeeds to the new address. The complete archives of this blog will remain here as there are many incoming links, but I will slowly, over the next few months, republish some of the best Circadiana posts over there. I hope you all move there with me - the new blog will be even better (and prettier) than this one. Update: Due to technical problems, the new blogs will nost start tomorrow (Friday) but later, hopefully Monday of next week. I'll keep you posted. There is a new study on PLoS - Biology that is getting some traction in the media and which caught my attention because it was supposed to be about circadian rhythms. So, I downloaded the paper and read it through to see what it is really about. Well, it is a decent study, but, unfortunately, it has nothing to do with circadian rhythms. Many examples of tritrophic relationships involve parasitoids (usually small wasps) being attracted by plant volatiles which are released in response to herbivory by insect (usually moth) larvae. So, if a caterpillar munches on a plant, that plant releases chemicals which attract the wasps. When a wasp arrives, she injects her eggs into the caterpillar, often together with a cocktail of toxins or other chemicals that alter the development of the caterpillar, keeping it in the larval stage longer than normal, thus giving wasp eggs sufficient time to hatch and the little wasp larvae to eat their way out (and in the process devouring and killing the caterpillar). It has also been known for a while now that wasps are strictly diurnal, i.e., they fly only during the day. It has also been known for a couple of years now that plants release the alarm chemicals mostly during the day. Production of this odors takes energy which would be wasted at night when the wasps are not active. Activity of caterpillars is much harder to assess, and many people in the field swear that there is no diurnal rhythm of their activity, i.e., they are as likely to feed on leaves at night as during the day, though some mild rhtyhms were found in some species. What this paper addresses is the problem with the previous studies of the caterpillar rhythms. 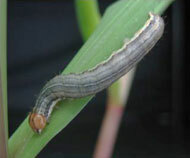 Those were assessed on larvae placed on their host plants. Thus, those were not well-controlled experiments because apart from a light-dark cycle, the larvae were simultaneously exposed to signals generated by the plants. So, in this paper, the larve were kept in cups and fed synthetic food. They were assayed in light and in darkness in a series of experiments, first in the absence of plants, then in the presence of uninjured plants, and finally in the presence of day-time and night-time volatiles released by either uninjured or insect-injured plants. Result: the activity of caterpillars was affected by the presence of plants. Larvae were more likely to hide in the presence of plants than in their absence, even more in the presence of day-time emissions than night-time emission from uninjured plants, and even more in the presence of day-time emissions from the injured plants, suggesting that plant volatiles, especially those produced during the day, and especially those produced by grazed plants, inhibit foraging activity of larvae and promote hiding activity of larvae. The statistics are nice and strong and the conclusion drawn from the data is correct. If they framed it in this way, the study would be fine. But, for some unkown reason, they decided to frame the study within the context of "sexier" circadian research. "Although many organisms show daily rhythms in their activity patterns, the mechanistic causes of these patterns are poorly understood." is the first sentence of the Abstract of the paper that contains the statement even in the title: Plant Volatiles, Rather than Light, Determine the Nocturnal Behavior of a Caterpillar (PDF). Their first reference is to the Saunders' book on Insect Clocks and most of the Introduction and Discussion treats the results of the paper in the circadian context. "The caterpillars are believed to have evolved a nocturnal lifestyle in order to avoid predatory wasps that maraud throughout the day, but why they don't use light cues like most other organisms remains a mystery, Takabayashi says" in a press release. Yet, their experimental methods cannot say anything about response of circadian rhythms to light in these caterpillars. Why? First, there is nothing said about the pre-treatment. Were the insects kept in light-dark cycle, constant dark or constant light prior to the onset of the experiment? Were they kept on plants or on artifical diet prior to the onset of the experiment? This information is essential to evaluate how entrained their circadian rhythms were prior to the experiment. Was the onset of the experiment at the lights-off, lights-on or some other phase of the pre-treatment cycle? Just swithing on or off the lights on them at just any time of day or night will not shift their clocks so fast, or even at all, depending on their phase response. Even if they have a fast-resetting Type O Phase Response Curve (and there is no reason to believe they do - those are rare in the animal kingdom), monitoring the response for just eight hours is not enough - the clocks take much longer to reset. There is a reason why circadian rhythms are monitored over many days, weeks, months or even years and why the data collected over the first 2-5 days after any kind of treatment (light transition, light pulse, injections of chemicals, etc.) are not used in statistical analysis - the researcher waits that long until the post-treatment rhythm stabilizes. So, from their data, we cannot say if plant volatiles affect the circadian clock. We also cannot say if the caterpillar clock is or is not responsive to light. The data are consistent with the hypothesis that their clock is light-blind, but is equally consistent with the hypothesis that it is not. The data are consistent with the hypothesis that plant volatiles entrain the clock, but also consistent with the hypothesis that plant odors exert only a masking effect on the overt rhythm of activity - the hands of the clock - without affecting the underlying gears of the clock. Carl Zimmer wisely avoids any discussion of circadian clocks in his excellent description of what the paper really shows on Loom. The behavior is affected by plant volatiles. Period. Excellent demonstration of the effect. No need to bring in the stuff that was not really addressed by the research, no matter how much the authors wish it may be so. Most of the others just parrot the press release, e.g., Biology News, Brightsurf, Our Diagnosis, New Scientist, 3 Quarks daily, EurekAlert and Biology Blog. The next edition of Tangled Bank is fast approaching - it will appear on my other blog Science And Politics on Wednesday May 24th, very early in the morning. The deadline is 23rd at 8pm ET. I have only eight entries so far - come on, people! Out of more than 400 science-related blogs, I get only eight posts? Some carnivals have very strict entry policies - Carnival of Liberals is limited to the 10 best posts, and I And The Bird is limited to one post per blogger. Some carnivals actively encourage multiple submissions from each blogger, e.g., Teaching Carnival, Circus of the Spineless and Animalcules. Most other carnivals are ambiguous about the rules and it is up to each host to spell those out. I am one of those hosts who likes big carnivals and encourages multiple entries. So, for this Tangled Bank send your best. If you send 15 entries, I'll pick 2 or 3 I like the best, but do not be afraid to send in multiple suggestions. Also, you can nominate someone else's post if you think it is really good and deserves a broader audience. If you click on it, you will be transported to the homepage of one of my favourite science educational programs - the Project Exploration. This project is the brainchild of paleontologist Paul Sereno and his wife, historian and educator Gabrielle Lyons. 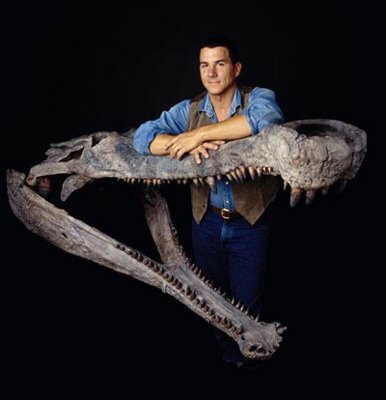 If you do not know who Paul Sereno is, you are probably not interested in dinosaurs at all, as he is the #1 Big Star of Dinosaur Paleontology. Among else, he has discovered Carcharodontosaurus saharicus, one of the largest dinosaur carnivores - the African version of T.rex. Jobaria tiguidensis is the best preserved skeleton of a long-necked dinosaur. Sarcosuchus imperator, better known as Supercroc was big enough crocodile to hunt and eat dinosaurs. 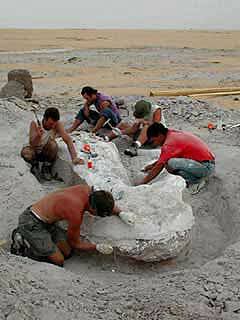 He has also discovered Eoraptor lunensis and Herrerasaurus ischigualastensis, two of the oldest dino fossils belonging to some of the earliest dinosaurs. Deltadromeus agilis, discovered by Gabrielle Lyons, was one of the fastest dinosaurs ever. I had a good fortune to see Sereno give a talk and briefly to introduce myself to him, at the 2000 meeting of the Society for Integrative and Comparative Biology in Chicago. My brother knows him much better, as he and Gabrielle knew each other from grad school. Thanks to their friendship I got, over the years, a bunch of informational materials from the Project Exploration, as well as some really cool stuff, like some Sahara sand, a small plant fossil and several T-shirts that you cannot buy - they are not for sale. One day when I get out of financial problems, I will make it an annual ritual to donate to their program, devoted to bringing excitement about science to inner-city schoolchildren, particularly minorities and girls. In the meantime, I hope that you donate. They do not take any money from the government and depend on individual donations for their operation. You can donate your money, or alternatives (stocks, time, work), easily through their website. So, click on the button now, or whenever you want in the future, to see what they are doing, to get help if you are a science teacher, or to donate to a worthy cause. * Students participating in our field programs are graduating high school at an 18% higher rate than their peers. * Students are pursuing science in college—25% of all students and 34% of our girls declare science as their major. 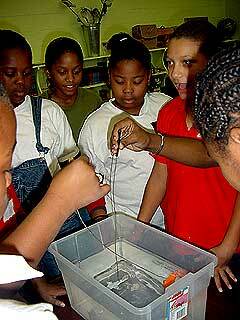 * The girls in our programs are pursuing science in college at five times the national average. In the previous posts in this series, I covered the circadian clocks in Synechococcus, potential circadian clocks in a couple of other bacteria, and the presence of clock genes (thus potentially clocks) in a number of other bacteria. But what happened to the microbiological workhorse, the Escherichia coli? Does it have a clock? Hasn't anyone checked? Believe it or not, this question is colored by politics. But I have to give you a little background first. Latter half of the 19th and the first half of the 20th century saw a number of researchers discovering circadian rhythms independently from each other. They came from different backgrounds and did research in a variety of questions in different organisms. There were botanists and entomologists, physiologists and ecologists, behavioral biologists and microbiologists, evolutionary biologists and physicians. The founding moment of the field was the Cold Spring Harbour meeting in 1960, which produced the Proceedings (Cold Spring Harbor Symposia on Quantitative Biology: Volume XXV. Biological Clocks. New York: Cold Spring Harbor Press, 1960.) which is, arguably, the founding document of the field. It is there and then that everyone realized that they were all studying the same phenomenon, they agreed on common terminology, and learned from each other what became standard experimantal methods in the field. Not much later, in the 1970s, the Society for Research in Biological Rhythms (SRBR) was formed and had its first meeting. Apart from wonderful talks and posters, and rambunctious partying, one of the key moments of the meeting was the election of the Society President. By that time, something akin to War of the Roses was going on in the field. The two candidates for the position were the leaders of the two factions. One faction, led by Franz Halberg (who coined the term "circadian" among else), was medically minded and argued for a practical, applied approach to the study of rhythmic phenomena, coupling mathematical modelling with clinical studies in humans and some model animals like rats and mice. The other faction, led by Colin Pittendrigh (student of Theodozius Dobzhansky), came from an evolutionary, ecological and ethological tradition, arguing for an integrative and comparative approach to the study of the basic science of biological rhythms. Fortunately for all, Pittendrigh won. The rest is history - chronobiology took off and nobody could stop its meteoric rise. The human/medical approach that plagued the sleep research for so many decades was avoided by chronobiology. But the bad blood between Pittendrighians and the Halbergians remained for a long time - it actually still simmers underneath the surface, especially among the seniors in the field. Most of the top researchers in the field, the meeting organizers, the Society officials, textbook writers, journal editors, and the plenary lecture speakers are Pittendrigh's academic children, grandchildren and great-grandchildren (OK, I am one, too). A circadian rhythm in bacteria was documented time-microscopically in 1961 on impeccable data collected by Lore A. Rogers (a noted bacteriologist described by a Cosmos Club Vignette of December 1967 as "the bright star in the [U.S. Department of Agriculture's] scientific horizon before World War II"). Rogers' data stemmed from a fluid culture of E. coli, analyzed both by a periodogram and by power spectra, showing clear free-running circadians. Nonetheless, for years international symposia and cell chronobiologists in particular, including a committee formed by them in 1975, held the view that circadians are a property only of eukaryotes. I wrote to each committee member asking why they ignored the demonstration in E. coli and the extension of the finding by Sturtevant in John Pauly's laboratory in Arkansas. I regarded, and continue to regard the organizers as friends. Both Woody Hastings and the late Hans-Georg Schweiger thereafter extended their focus to circaseptans, documenting their open mind. Schweiger became a visiting professor at the University of Minnesota and was my house guest (and I his house and institute guest), and in later years cooperated extremely closely. A friend on the committee, however, wrote that he "ate crow" and noted that the "consensus" had been that there were "too many analyses" in the 1961 publication and again too much time-microscopy in the follow-up study, a thesis notwithstanding. The consensus was also in keeping with negative unpublished results by several symposium participants; so went the critique leading to the committee's decree that circadians are limited to eukaryotes. Jürgen Aschoff also responded by asking something like "Do you wish to hold us responsible for posterity?" I answered in a qualified affirmative, that the rules we postulate today may be revised tomorrow, always based on data. Microbial circadians abound today and constitute an active field of investigation. Ah, how diplomatically he had to put it for publication! Well, I dug through Google Scholar, then through ISI Web of Science, and none of the papers Halberg mentions (see below) exist online - they are just too old. So, I cannot tell you now what I think about this question. Perhaps one day I'll be idle and have a lot of time and will dig out and photocopy the hardcopies of these papers at the library and check the data myself. For now, let's keep the question open. Perhaps the 1930 data were nice and clear, while 1970s data not so because of decades of relaxed selection for rhythmicity in laboratory cultures of E.coli held in acyclic conditions in the incubators. Perhaps they just lost rhythms during the intervening four decades. A new test should, perhaps, be performed on fresh wild-caught Escherichia coli. At least we know that short-period cycles can evolve in E.coli under artifical selection , so, even if they do not naturally have circadian clocks, we can make them evolve one and solve the political problem once and for all. Halberg F, Conner RL: Circadian organization and microbiology: Variance spectra and a periodogram on behavior of Escherichia coli growing in fluid culture. Proc minn Acad Sci 1961, 29:227-239. Rogers LA, Greenbank GR: The intermittent growth of bacterial cultures. J Bacteriol 1930, 19:181-190. Halberg F, Cornélissen G: The spectrum of rhythms in microorganisms revisited. Chronobiologia 1991, 18:114. Sturtevant R: Circadian patterns in linear growth of Escherichia coli. Anat Rec 1973, 175:453. Sturtevant R: Circadian variability in Klebsiella demonstrated by cosinor analysis. Int J Chronobiol 1973, 1:141-146. Next edition of Tangled Bank, the blog carnival covering science, nature, medicine, environment and the intersection between science and society, will be held on Wednesday, May 24th, on my other blog, Science And Politics. 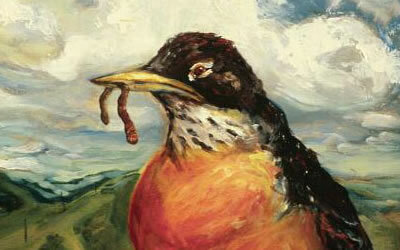 Send your entries by Tuesday, May 23th at 5pm (Eastern) to: Coturnix1 AT aol DOT com. Seems like there is a good deal of interest today in Rep Patrick Kennedy's one-car accident last evening that he has attributed to taking a combination of the prescription sleep aid, Ambien (zolpidem tartrate), and Phenergan (promethazine), an old phenothiazine antipsychotic drug most often used now to treat nausea and gastrointestinal upset. However, this should be a lesson to all who take Ambien that they should 1) go immediately to bed after taking the drug, 2) do not combine it with any other CNS depressant, including OTC antihistamines or alcohol, and 3) certainly do not drive an automobile after taking such a drug combination. Alcohol is not necessary to explain this case... unless one is trying to make a tabloid story out of this unfortunate incident. In a recent study, 20 daily smokers, who went without a cigarette for 24 hours, overestimated the duration of a 45 second interval. To the abstaining smokers, the interval felt approximately 50 percent longer than 45 seconds or more than one minute. In the study, 22 nonsmokers (12 male and 10 female), and 20 daily smokers (12 male and 8 female), ages 18 to 41, were asked to estimate the duration of a 45 second period of time in a laboratory setting. The smokers were asked to participate in two sessions, once while smoking as usual and once after having stopped for 24 hours. During each session, the participants were given these instructions: "In a moment, I'm going to say 'start' and then I will say 'stop.' When I say 'stop,' please tell me how much time you think has gone by in seconds. Please try not to count, but just tell me how much time you feel has gone by. Do you have any questions? Ready? Start. [45 second elapse] Stop." The time estimates made by the nonsmokers and the smokers before the abstinence period were similar and fairly accurate. However, after 24 hours without a cigarette, the smoker's accuracy declined significantly compared to both the nonsmokers and their own estimates before the abstinence period. There were no gender differences in any of the outcomes. The researchers conclude, "That 24-hour cigarette smoking abstinence can alter perceptions of time in a healthy, young, non-clinical population of smokers emphasizes the need for future research to delineate the attention --altering effects of nicotine and nicotine withdrawal on addiction processes." Sayette MA, Loewenstein G, Kirchner TR, Travis T., Effects of smoking urge on temporal cognition, Psychol Addict Behav. 2005 Mar;19(1):88-93. The authors examined temporal aspects of smoking urge. In Experiment 1, smokers assigned to high- or low-urge conditions were informed they would be allowed to smoke in 2.5 min. They next completed measures of time perception. High-urge smokers reported 45 s to pass significantly more slowly than did low-urge smokers. In Experiment 2, the high-urge smokers from Experiment 1 anticipated that their urges would climb steadily over the next 45 min if they were not permitted to smoke. Another group of high-urge smokers actually reported their urges over 45 min. These urge ratings did not show the steady rise anticipated by the first group. Results suggest that smoking urge may affect time perception and that craving smokers overpredict the duration and intensity of their own future smoking urges if they abstain. The latter paper is also analyzed and explained by Chris of Mixing Memory - you should go and read it here.